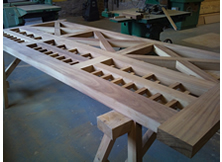 All of our gates are expertly hand crafted in our workshop using traditional joinery methods and the best timber available, mainly Iroko. Depending on your needs and tastes, bespoke gates can be selected from our gallery, or can be individually designed to compliment individual settings and landscapes. We can work with your plans, drawings, pictures or specifications. We offer a full personal service, free quotes, professional consultancy and fitting service. To ensure all our timber gates have an elegant look and feel, we supply a range of long lasting, heavy duty, black or galvanised ironmongery to match your gate design, or our blacksmith can make individual pieces. We will advise you as to the best option for your gates. We also offer our customers an after sales platinum or gold gate care package to ensure maximum lifespan. At Lancashire Gates, we put one thing above all - Quality. We are committed to providing a personal and flexible service to all our customers ensuring customer satisfaction to the highest degree. 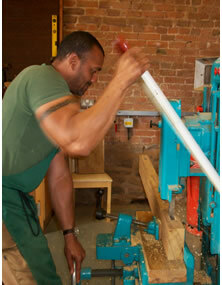 We welcome visitors to view our gates before, during & after the manufacturing process. Situated at Brookdale Farm in picturesque Lathom in Ormskirk, Lancashire, Lancashire Gates is a friendly, family business run by Edmund and Jeneane Dublin. 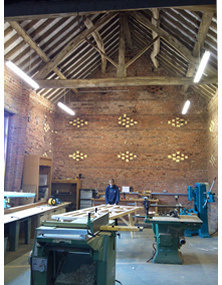 Edmund is a Cumbrian lad, with 25 years experience and served his time as a bench hand carpenter with excellent grades including advanced carpentry. He has been a carpenter by trade since leaving school, but had a brief spell away from carpentry after being tempted from the tools into a junior management position. He successfully worked his way up to senior management, securing a position as contracts manager. While financially rewarding, his heart was always in carpentry and Edmund returned to ‘the tools’ after seeing people take a lot of pride in the exterior of their properties whilst neglecting the most important part, which is the entrance; ‘Like having a smile with no teeth’! He always knew his heart was in carpentry and Lancashire Gates was conceived. One of Edmunds sayings is: “your gate is the first thing you see and touch on entering your property and the last thing on leaving”. Lancashire Gates Employs only quality craftsmen and are small enough to deal with customers personally and on a one to one basis, yet large enough to cope with the growing interest in the business. 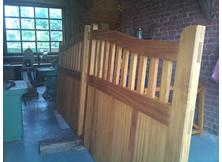 We design, manufacture and install individual hardwood gates to customer requirements throughout the North West.